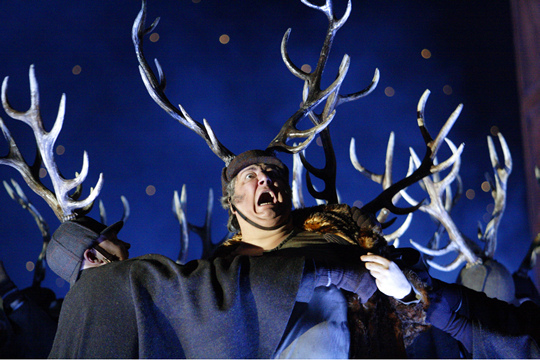 Verdi’s final opera is a consummate blend of comedy, shades of melodrama, and self-parody. It takes a truly disciplined production to manifest some of these associations, and Robert Carson’s crowd pleaser at the Royal Opera takes great strides toward this difficult goal. It helped, though, that the singers were first class; the evening was by far one of the best of season (save, perhaps, the earlier Rigoletto, the review of which is found here). From the moment he opened his mouth Ambrogio Maestri owned the stage. He is a Falstaff with swagger and conviction, one that can easily sing the vaulted Fs and Gs and still communicate in a way that makes one feel as though they are being spoken to directly. Even when singing brashly he managed his phrases (including those in falsetto) with a tasteful sense of style. Character tenors are not always the cream of the crop, but it was refreshing to hear Carlo Borsi, in his Royal Opera House debut, singing robustly. His tone was at times a bit shallow sounding and he does have the tendency to declaim often, but overall Borsi was a great bit of extra comic relief. The chemistry between lackeys Bardolph and Pistol (arguably more important than the two lovers’) was convincing; both Alasdair Elliott and Lukas Jakobski deserve credit for their fine singing and comic timing. As Meg Page, Kai Rüütel seemed lost in the texture of the production (more on this below), but still managed to come through with a clear tone when it mattered. More impressive were Marie-Nicole Lemieux and Ana María Martínez as Mistress Quickly and Alice Ford, respectively. Lemieux has a sumptuous contralto that is robust and full of dark purple hues; her character was a mix of volatility and restraint, singing through Verdi’s melodramatic lines with ease. Martínez has a fantastic clarion tone and sings with all the power required by Verdi’s robust music coupled with the grace required by Mozart. Dalibor Jenis, as the evening’s Ford, was not only dramatically convincing, but his supple red hues, legato, boldness, and style made him one of the great musical treats of the performance. The similarity of the production’s atmosphere to that of Wisteria Lane is certainly not a coincidence. There were surprising boos from the audience during Robert Carson’s and Paul Steinberg’s curtain call, since the ornate wood paneling and Formica kitchens—for some—distracted from any meaningful messages in the work other than one implied in the program: similarities in class distinction between Elizabethan England and 1950s America. Admittedly it was perhaps too immersive. On the other hand, however, class tension is a topic often forgotten or glossed over in opera productions (and much operatic criticism), so it’s refreshing to see these issues highlighted. From another perspective, this sort of superficial set (and the characters’ elaborate costumes) allowed audience members to focus on the music with slightly more attention than is customary. The live horse, though, was a bit too much of a crowd pleaser. Daniele Gatti conducted the orchestra with finesse and style but the violins and brass sections deserve special credit for performing Verdi’s demanding score expertly. The chorus provided extra atmosphere, yet the stabbing choreography in the final scene was ludicrous.